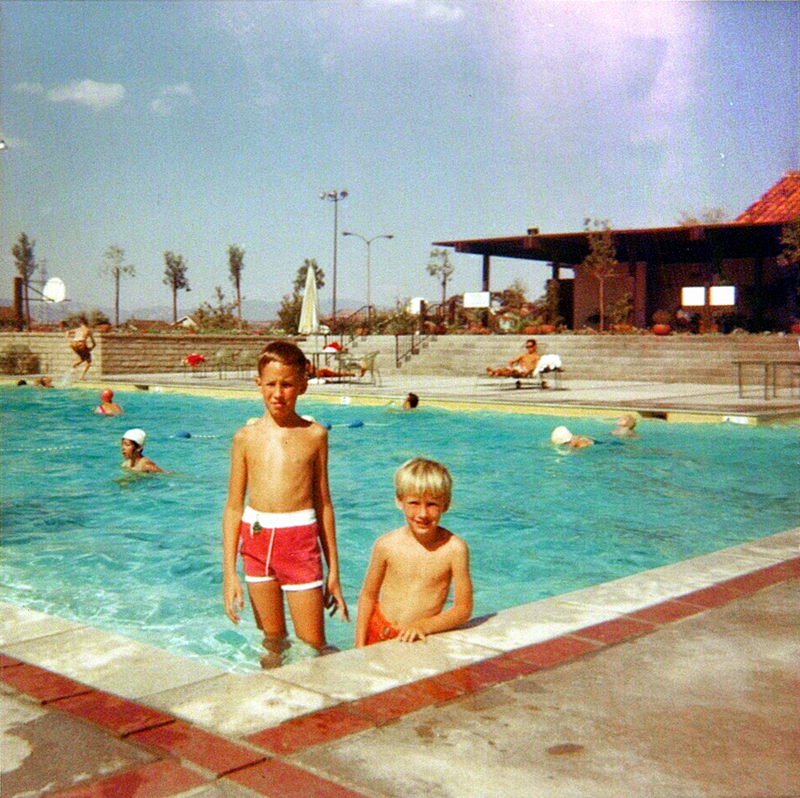 Greg Hammermeister (left) and his younger brother Mike Hammermeister in the pool at the Old Orchard I clubhouse in Valenica, September 1968. Valencia began in 1965 with the opening of the Old Orchard shopping center at the northwest corner of Lyons Avenue and the new Orchard Village Road. The shopping center was actually a component of The Newhall Land and Farming Co.'s first residential subdivision, Old Orchard I — a self-contained, triangular-shaped community of tract homes on cul-de-sacs with an elementary school (opened 1969-70), park, clubhouse, senior apartments and a newfangled paseo system to tie them all together. The first tract homes were built in 1967 and 1968 and had an initial price tag of $25,000. They were followed in 1968 and 1969 by more homes that were sandwiched between Orchard Village Road on the west and High School (1946) and Placerita Junior High (1961) on the east. Hb6801: 19200 dpi jpeg from smaller jpeg courtesy of Greg Hammermeister.